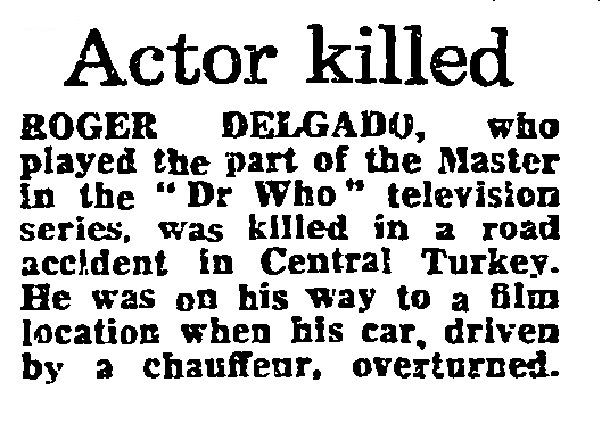 ROGER DELGADO, who played the part of the Master in the "Dr Who" television series, was killed in a road accident in Central Turkey. He was on his way to a film location when his car, driven by a chauffeur, overturned. APA 6th ed. : (1973-06-20). Actor killed. The Guardian p. 1. MLA 7th ed. : "Actor killed." The Guardian [add city] 1973-06-20, 1. Print. Turabian: "Actor killed." The Guardian, 1973-06-20, section, 1 edition.